AVCWare Video Converter Standard is capable of converting nearly all popular video formats like AVI, MPEG, WMV, DivX, MP4, RM, MOV, XviD, 3GP and audio formats MP3, WMA, WAV, RA, M4A, AAC, AC3, OGG between each other. With AVCWare Video Converter Standard, you can convert any video/audio/animated picture to make it playable on your PSP, PS3, iPod, iPhone, Apple TV, Xbox, Google phones, iPad and other digital multimedia devices. 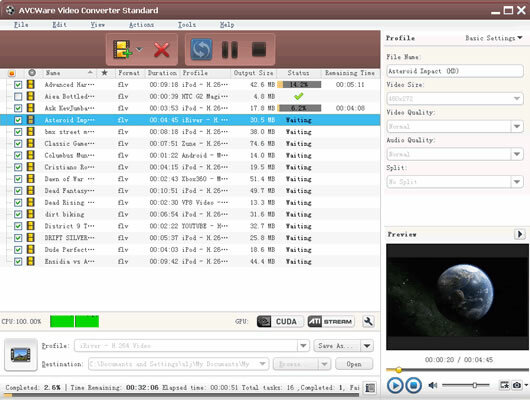 1.Convert between Multiple Video Formats like AVI, MPEG, WMV, MP4, FLV, MKV, AVCHD Video (*.m2ts, *.mts), etc. 1.Convert between multiple video formats, including most popular videos: AVI, MPEG, WMV, MP4, FLV, MKV, H.264/MPEG-4, DivX, XviD, MOV, RM, RMVB, M4V, VOB, ASF, 3GP, 3G2, SWF, H.261, H.264, DV, DIF, MJPG, MJPEG, DVR-MS, NUT, QT, YUV, DAT, MPV, NSV and etc. 2.Convert between various audio formats, MP3, WMA, AAC, WAV, CDA, OGG, CUE, M4A, RA, RAM, AC3, MP2, AIFF, AU, MPA, SUN AU and etc. 3.Enabled with NVIDIA CUDA, more CPU resources can be spared for other applications, making your computer run much smoother. 4.Compute the exact size of output file by Bitrate Calculator tool. 5.You can play the video and audio files in an independent media player and take video snapshot anytime during playing. 6.Set it to work in the background will spare more CPU resources for other applications. 7.Convert multiple files simultaneously with multi-threading and batch processing. 8.You can preset the program to auto exit, shut down, stand by, or hibernate your PC after a task is completed. 9.The interface languages include English, German, Spanish, French, Japanese, Simplified or Traditional Chinese.